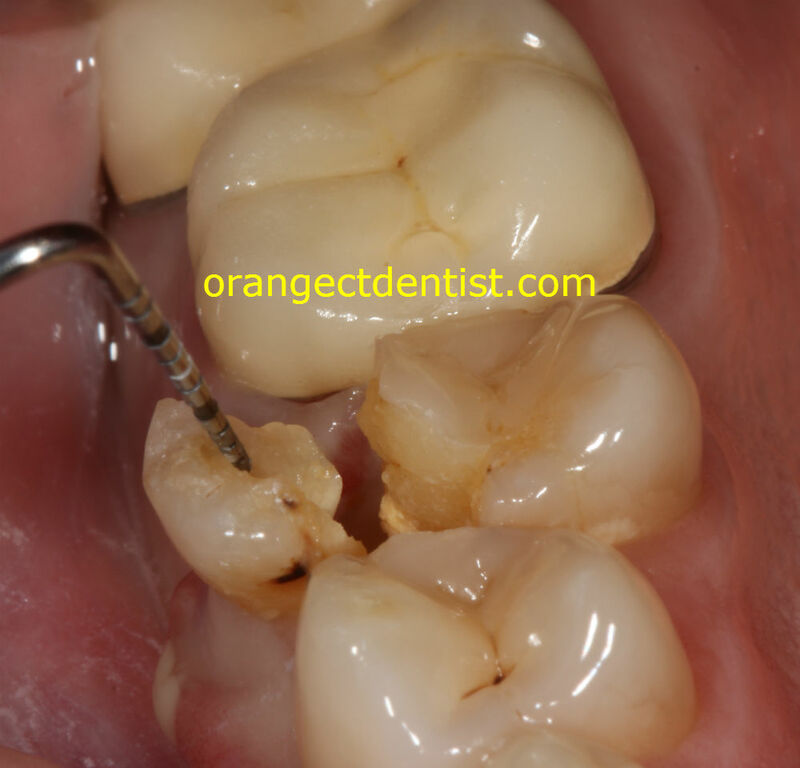 When we do a root canal on a back tooth, we nearly always recommend a crown. Many of our patients will naturally ask us why? Frequently, the last thing a patient wants to do after they have recently had a root canal is to then sit in the chair for a crown! We certainly wouldn’t want to either. So why? This premolar on one of our patients literally split in two! After the root canal, we had recommended a crown, but he declined. The patient lost the tooth and needed an implant. Photo and subsequent dentistry by Dr. Nicholas Calcaterra. 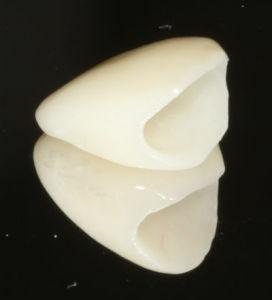 As described in the photo above, this tooth cracked into two pieces with a fracture going deep beneath the gum tissue. If he had a crown, this would not have occured. He lost the tooth and needed a dental implant. When a tooth has had a root canal, it becomes brittle. It loses the ability to flex slightly under loads. In addition, there is less natural tooth structure remaining, typically because of a past history of dental decay. When you put that all together, you have a very weak tooth. The jaw muscles, specifically the masseter, are generally considered to be the strongest muscles in the human body. In one test, the masseter was able to generate a force of 975 pounds! This lower molar fractured after root canal treatment. 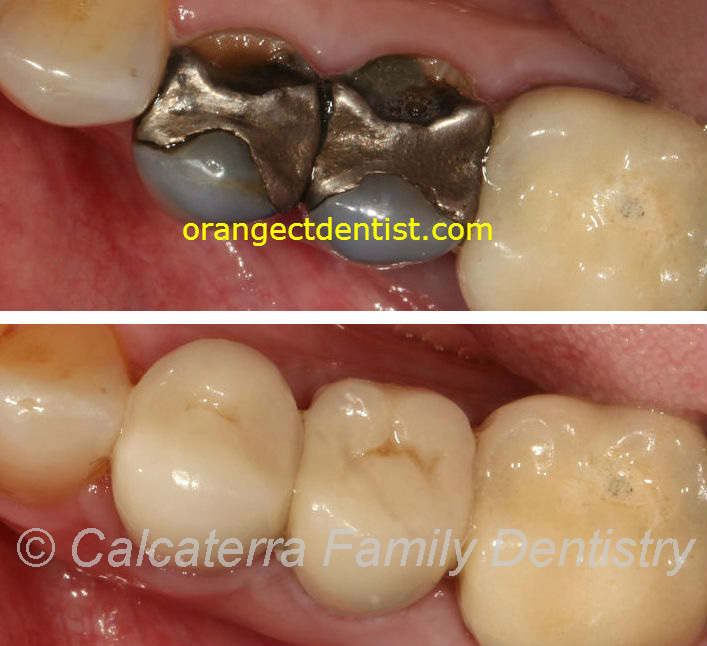 In this case, the tooth was able to be saved by doing a special procedure called crown lengthening and then placing a crown. 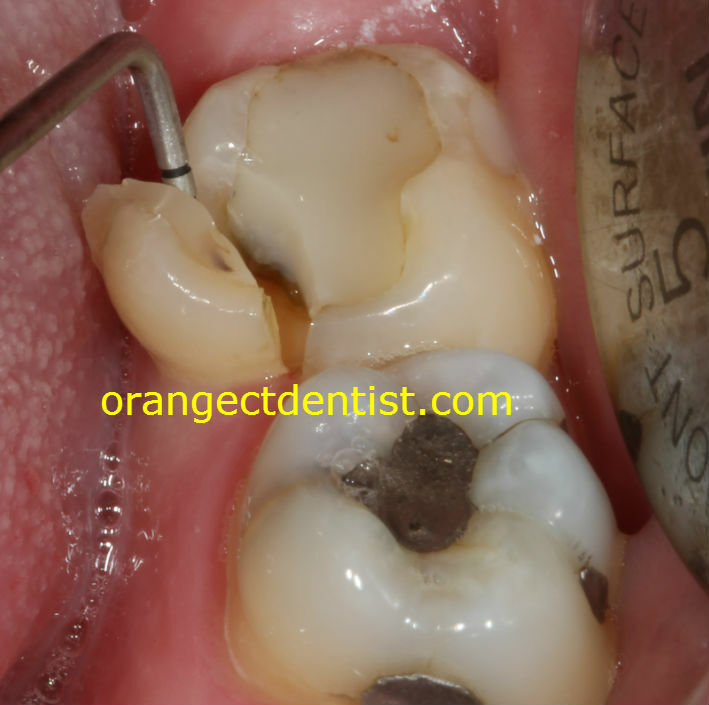 This crown will slide over the tooth, protecting it. A dental crown, often called a “cap”, is a custom fabricated combination of either porcelain or metal that covers the entire surface of the tooth above the gumline. When you chew, the powerful forces that hit the crown are then directed down the long axis of the tooth. In addition, the chewing forces cannot exert a splitting force onto the tooth, because the entire tooth is covered. As a result, catastrophic fractures like the ones seen above are avoided. The photo to the right shows a crown for one of our patients. It will fit completely over the tooth. Not only will it prevent fractures but it will make the tooth look much more natural and esthetic. We hope that the narrative and the photos show you that teeth can break. And when they do break, the results can be catastrophic! So if/when you need a root canals on a back tooth, you should strongly consider getting a crown if your dentist recommends it.